Other comments received were just as difficult for me to relate to: They cost too much (ours didn’t since we made them), they are difficult to install (I kind of like doing stuff like that), they don’t have good water pressure (they work great for filling up watering cans), HOA rules won’t let me have one (we don’t have HOA’s) and it takes a long time to get them from the government. The second reason I’ve been having a hard time deciding how to respond is this: I’m trying my best to be a “green”, eco-friendly gardener. I admit, I’m not always “green” in everything I do. I own and drive an SUV (although, granted, I don’t really drive much). I run the AC when I’m hot (and I’m at that age when I’m hot more often than not). And SOMETIMES I forget to turn off the water when I brush my teeth. 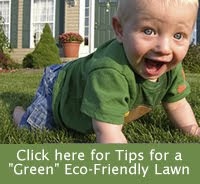 But when it comes to my garden and landscape, I really try to be as “green” as possible. So, we have two rain barrels and we intend to build a few more when we get the chance. The third reason I can’t relate to the many responses I got is this: many local government organizations are willing to HELP their residents do the right, eco-friendly thing, by offering assistance and cash rebates. THIS IS A REALLY GOOD THING!! The fact that they are BEHIND in getting to everyone is also a good thing. It means that people are participating. For goodness sakes, and for GREEN-ness sake, let’s not discourage these programs. Let’s participate, be patient and be appreciative. If we have suggestions to work the kinks out of the programs, let’s offer them. But let’s not stomp on the fingers of the groups that are trying to help us create our “green” gardens. Okay, now before I redirect you to a post that responds to many of these concerns, I just wanted to comment again about the benefits of rain barrels. Yes, they do capture and hold water, which does help a little bit in times of drought. And, as pointed out by Garden Ruth on Facebook: “I have only one outdoor spigot and using rain barrels on the side without a water source helps me avoid having to install another spigot." But another VERY important thing that they do is help redirect stormwater runoff. From The District Department of the Environment website: Rainwater becomes stormwater when rain falls on impervious surfaces such as rooftops, driveways, roads, sidewalks and even lawns. As stormwater moves from our yards to our streams it picks up pollutants such as oil and grease from our roadways and driveways, nutrients from fertilizers on our lawns, and bacteria from pet waste and other animal excrement. Once in the stream, the fast-moving surges of water associated with storms cause erosion and destroys habitat for fish and other wildlife. There are certainly lots of other ways to cut down on stormwater runoff. You can plant a rain garden. You can install a nice, paver driveway. You can quit using any chemicals in your landscape so that the rainwater that does come off of your property doesn’t cause as many problems. And of course, there is the option of not doing anything at all, if you are okay with that one. But just keep in mind that what you do in your landscape does affect a lot of other people, as pointed out by reader, Leigh Pickering of Arlington.